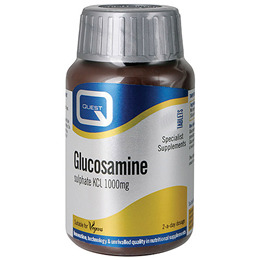 Quest Glucosamine Sulphate KCl is a glucosamine food supplement. A dose of 1,500mg a day is recommended to support joints. Why use Quest Glucosamine Sulphate KCl? Chondroitin can be synthesised from glucosamine. Use to support joint health and mobility. Bulking agent: Microcrystalline Cellulose, Glucosamine Sulphate KCl, Magnesium Stearate, Glazing Agent: hypromellose. Below are reviews of Glucosamine Sulphate KCl - 90 x 1000mg Tablets by bodykind customers. If you have tried this product we'd love to hear what you think so please leave a review.